The events that finally led to the Aaron Burr duel with Alexander Hamilton had been building up for many years. The enmity between the political antagonists culminated in the most famous duel in American History. The duel was held in Weehawken, New Jersey on July 11, 1804 at 7.00am. Alexander Hamilton (1757-1804), famous as America's first Secretary of the Treasury, was fatally shot by Vice President Aaron Burr (1756 – 1836). Aaron Burr Duel - What was a duel? Definition: A duel was formal armed combat between two people, usually fought with deadly weapons such as pistols, in order to settle a point of honor. 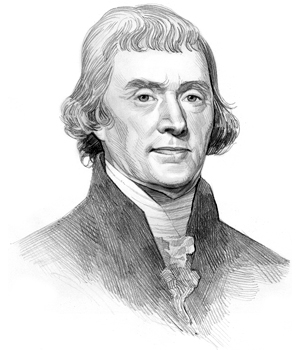 Thomas Jefferson was the 3rd American President who served in office from March 4, 1801 to March 4, 1809. One of the most shocking events of his presidency was the Aaron Burr duel with Alexander Hamilton. The Aaron Burr Duel had been caused by personal animosity and political rivalry. 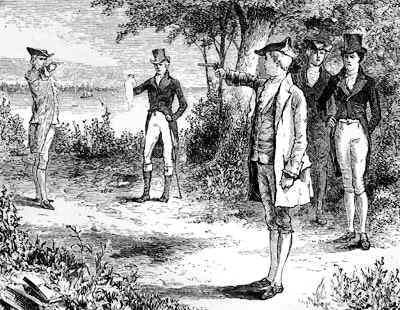 The facts about the Aaron Burr duel with Alexander Hamilton are detailed below. Duels were not uncommon and the cliffs below Weehawken on the Hudson River (where the Hamilton - Burr duel occurred) were a popular field of honor for New York duelists because of the uncertainty of whether New Jersey or New York jurisdiction applied. The location of duels were chosen to avoid interruption by the authorities and ensure jurisdictional ambiguity to avoid any legal consequences. The picture of the Aaron Burr Duel with Alexander Hamilton reflects the formal and deadly nature of this type of combat. There were strict rules and protocol to participating in a duel. ● The Aaron Burr duel was initiated by Burr who challenged Hamilton to a duel - perhaps by flinging his glove before him, the origin of the phrase "throwing down the gauntlet"
● Each man would have nominated a trusted friend, called a "second"
● The Seconds would decide the time and location of the duel - the "field of honor"
Fact 3: What was the reason for the duel? Alexander Hamilton had called Vice President Aaron Burr "a dangerous man, and one who ought not to be trusted with the reins of government" which had been printed in a newspaper. Aaron Burr requested an immediate retraction and apology but Alexander Hamilton refused. Fact 11: How did the Alexander Hamilton die? The ball of the pistol ball lodged next to his spine. He died in considerable pain the following day. Fact 13: How old were the duelists? Alexander Hamilton was 47 years old and Aaron Burr was 48 years old. The info about the Aaron Burr Duel provides interesting facts and important information about important events and the progress of the United States during the early presidency of the 3rd President of the United States of America. The article on the Aaron Burr Duel provides an overview of one of the famous events during his presidential term in office. The following video will give you additional important facts, history and dates about the political events experienced by the 3rd American President whose presidency spanned from March 4, 1801 to March 4, 1809.